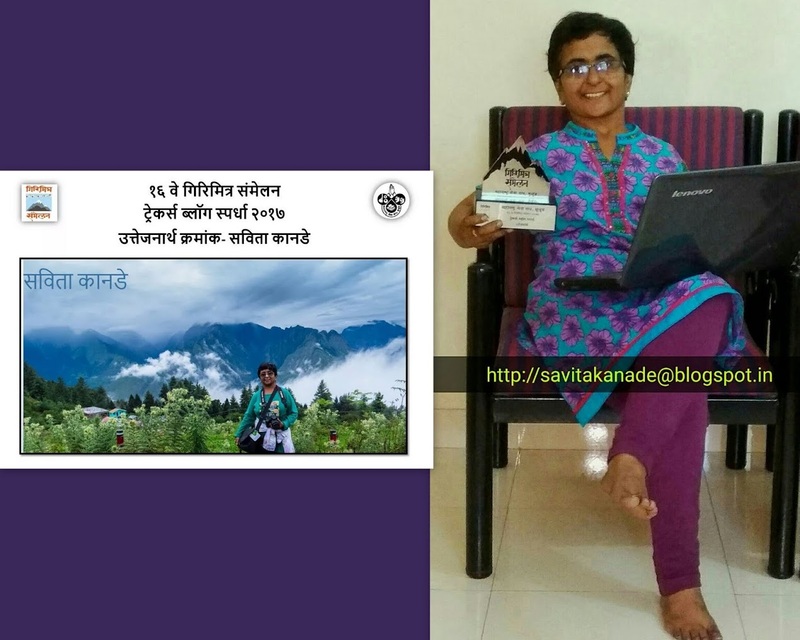 सविता कानडे : My path on trekking began at the age of 47.....A .journey of self-exploration! My path on trekking began at the age of 47.....A .journey of self-exploration! I started trekking at these places 3 years back in 2015 and was 47 year old. I would like to mention age here because before this I was never involved in any physical exercise regularly. The life was truly focused on school, college, job, and then family responsibilities. I used to do jumping rope or go for walking in a garden when I used to feel like I put on weight! Till mid June 2017, I did 35 treks around Pune. One of them includes first experience of 300 ft rappelling and 60 ft valley crossing at Dukes Nose near Lonawala. Trek to valley of flowers and Everest Base Camp were my memorable treks ever. June 2016, I got a sense like I should write trek experiences and here I am! The drive behind, mainly was to highlight emotions I faced while trekking, contributing factors in overcoming physical and mental challenges and in achieving trek summit! You will not find any detail information related to trek, like history of the place, trek endurance, difficulty level, grade etc. This type of information is available there on internet, trekking website, books etc. You can also seek such information from trek leaders. Trek blogs, thus are solely focused on emotions and feelings! I am not sure whether this will help you in any way….but if it does…..it will be a wonderful feeling! At present, experiences written are in Marathi, my mother tongue…but very soon you will find posed them in English as well! I highly appreciate your reactions, remarks, comments and suggestions. Have a safe and joyful trekking! श्रद्धा मेहता : ट्रेकिंग क्षेत्रातील एक "झेनिथ"! About my trekking at the age of 47....a journey of feelings and self exploration!!! सविता कानडे. Picture Window theme. Powered by Blogger.